Jen made her mark on the NCAA record books continued right on through the professional level with the Akron Racers and has now become a Tincher Pitching Certified Instructor. When it comes to great pitchers, Jen Mineau had an outstanding career that continued right on through the professional level with the Akron Racers. Her reputation as one of the best began in high school in Schaghticoke, New York, where she holds many state high school records, having taken her team deep into the playoffs regularly, and Jen enjoyed a perfect 25-0 record on the way to the state championship. As a her class Valedictorian, Jen was poised to make her mark in college. Upon graduation, she attended Fordham University, where she was their number one starter for four years. She now holds virtually every single pitching record (career and single season) Fordham kept track of. This includes career marks for wins (101), strikeouts (1,390) and ERA (1.42). Over her four years, batters hit .161 against her, and she had an approximate 10:1 strikeout to walk ratio. She threw 10 No-Hitters, 5 of which were perfect games. As a Freshman, she was honored by Sports Illustrated for throwing a No-Hitter and a Perfect game in one week. Jen made her mark on the NCAA record books as well, being #4 all time in career perfect games (5), #15 all time in career no-hitters (10), and #16 all time in career strike outs (1390). At one point she threw 81.2 consecutive scoreless innings. *Jen also travels to Schaghticoke, NY once a month for lessons. Contact Jen for details. After I graduated in 2012, I started coaching college right away. However, I was finding that all the stuff I had been taught wasn’t helping the girls I was teaching. So, I did what I always do in times of uncertainty—I turned to the internet! After hours upon hours of video, I started to notice commonalities in pitchers that I liked watching and who were also successful. Clearly, these kids must be coming from the same place. Eventually, I tracked a girl back to Denny Tincher and Fluid Dynamics. I went to one clinic and I was HOOKED. That weekend, I started incorporating all the things I learned from Tincher crew into my own motion. I pitched a double header that Sunday, and I WASN’T SORE the following day. I hadn’t pitched in months, yet my accuracy was better than in was in college, and my speed/movement was consistent. At that point, I was sold—lock stock and barrel. 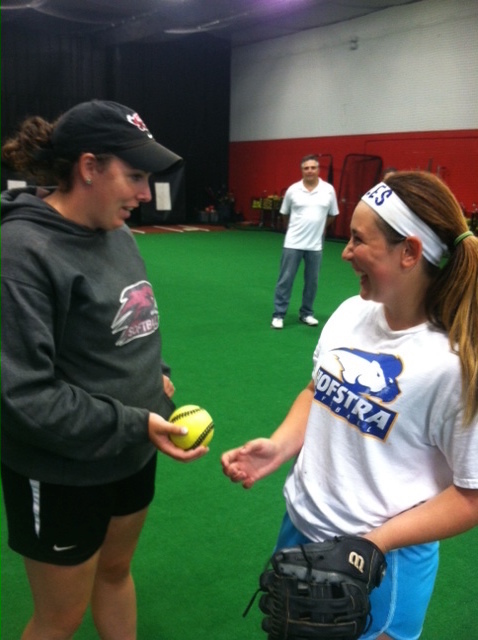 Usually, at clinics taught with traditional styles, you have the top third of kids that walk out with improvements. Usually 1-3 mph if they’re lucky, usually it’s less significant. The middle third are told to “go home and practice more, and maybe you’ll improve if you work hard enough.” Then there’s the bottom third, at which the instructors glance, shrug, and chalk their struggles up to non-athleticism. With Fluid Dynamics, I have seen ZERO kids fall into that bottom third. Exactly ZERO kids have walked away from Fluid Dynamics without seeing immediate improvement (however small), or an immediate diagnosis of their problems. It’s amazing—if you teach girls a style that works with their bodies, THEY LEARN. They IMPROVE. And most importantly, they don’t hurt themselves!